As originally posted here in June 2012, when an engineering mule of the 2015 Mustang was spotted by spy photographer KGP Photography and the new IRS was photographed, it was clear that the 2015 Mustang would have an all-new IRS rear suspension and that by design it would be a standard feature across all models. The detailed pictures also told us that the new IRS would not share parts with any other design or application, and that the rear track would be slightly wider. And it told us that the independent rear suspension that was originally developed for the S197 for 2005 has been abandoned and replaced by this all-new design. And that there is no relationship to the Falcon IRS whatsoever (that design having been abandoned in the earliest days of S197 development). The Mustang shown in the images below is a pre-production prototype, hand-built, so the painted mufflers and plated exhaust pipes certainly aren’t representative of a production build. They are only there so that the press photos look good. Production is planned for the fall of 2014, so the purpose of this particular car was for photography and marketing. It’s one of the Mustangs that was used for the images provided this week by Ford’s Media group, so it wasn’t driven at the press events this week and is kept in immaculate condition and appearance. Everything we’d reasoned out from those first images in June 2012 has held true, and now we have the final architectural details as well. The architectural details of both the front and rear suspensions. 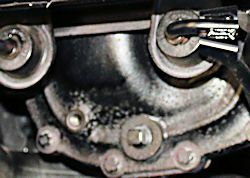 In the rear, the upper camber link and integral link (to provide an even better camber curve) couldn’t be seen in the earlier pictures. Now we know exactly how this suspension works. And it would have been reasonable to assume the upper shock mount was the usual vertical single bolt, but it isn’t and we didn’t. And we’ve only seen the vaguest outline of the subframe. And with the back, we’ve seen the new front suspension. It works on concert with the rear suspension to provide considerably more anti-dive and anti-squat. But again we have only been able to see a vague outline of the new (and lighter) front subframe. All we knew before was (aka all that we could see from the engine compartment spy photo) that the upper strut mount was very slightly lower and that the strut mount used 3 bolts instead of 4. Now we know about the dual-balljoint design with separate arms. It is not only lighter, but also provides better geometry and a better camber curve (although double a-arm would be better yet). And we learned that the front knuckle is steel, and the rear is aluminum. What’s changed since June 2012? First an interesting change – the finned differential cover on the engineering mule is missing here. As pre-production parts are hand-made (and therefore scarce)… perhaps the finned cover was just not available. And there is another odd hole just to the right of the drain plug that we can’t identify. It’d be great to see separate provision made here for a cooler, so that the drain and fill holes don’t have to be used. We know from the Boss program that a finned aluminum cover is needed to help with heat dissipation – in a sold axle hot fluid will expand into the axle tubes (and even escape thru the vent). In an IRS there is no such room for expansion. That may explain what appears to be a vent tube that wasn’t on the mule. Or this may be a drain for the fuel tank (used during development for calibration and emissions). In any case, racers will need a cooler for the differential. 2015 pre-production prototype. Vent tube? The exhaust system has also changed very slightly. Note the green arrows – these were the points we had issue with in our original analysis of the IRS. The bend going into the center resonator looks abrupt, but it may be just the angle of the original photos. 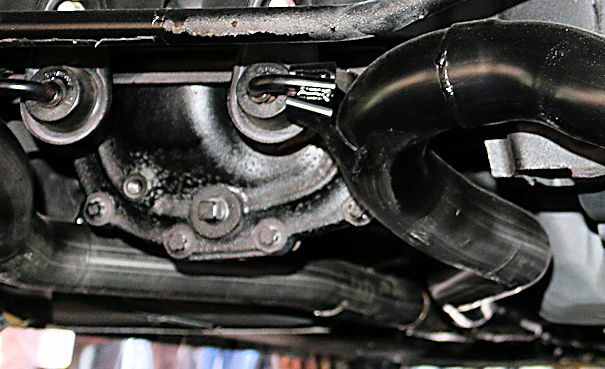 The exhaust hangers on the mule hang down to the point where they are very visible underneath the car (after all, owners will want to show off their IRS just as they want to show off their engine – and these look ugly). And the pipes were not to production spec, they had been cut by machine and seam welded. That’s good, but that it’s not how it is done in production. Here’s the pre-production system, built to final spec (with the possible exception of the cover). The hangers have been moved, and are now on the top of the pipes. Good! And the pipes use production welding techniques (and there is obvious aftermarket potential here for a better flowing system and smooth – but more expensive – joints). Better to get it in final spec now, rather than change it at the last moment and screw up the power output – as in the ’96 Cobra! Also, we can’t see the center resonator here in the picture, but it was on the car. We think it may have been raised up a bit but the angle wasn’t good and of course everything is painted black underneath. This is probably the same car that will be shown at the Detroit show next month. And we understand that a special edition model might be previewed there as well. We also know from the specifications provided by Ford that every model will get a limited slip differential. Available gear ratios depend on application, and include 3.15:1, 3.31:1, 3.55:1, and 3.73:1. No surprises there. Coupled to these are slightly improved versions of the existing MT82 6-speed manual and the existing Ford 6-speed automatic transmission. Disappointing, but not surprising. What don’t we know yet about the IRS? 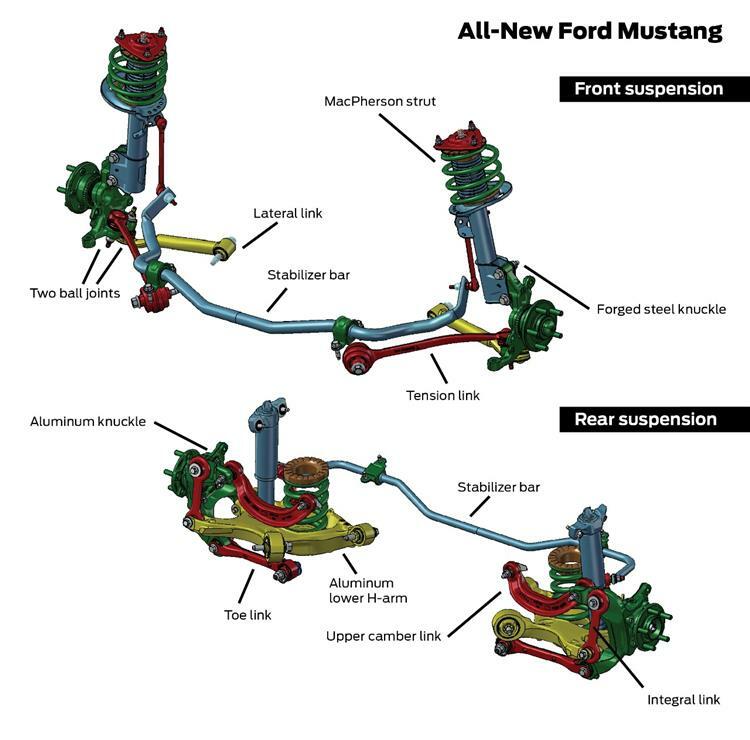 spring rates, shock types, sway bar size – base model and upper editions. 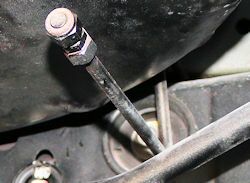 any built-in provision for camber adjustment. The press introduction on December 5th was only a preliminary and early introduction to the car. We understand that another one is planned for later in 2014 before production begins. If delivery starts in the fall, then the usual press introductions in May and June will probably be where we find out the rest of the details. Until then, we’ve got a lot to process, and probably more to see in Detroit and in the 50th anniversary events in April.